Based in Tucson, Ariz., Abram Shaner has been writing since 2005. He has formulated business plans, health plans and reports for various companies. Shaner brings hotel, massage, fitness and construction expertise to his writing. He is a licensed massage therapist and holds a Bachelor of Science in hotel and restaurant management from Northern Arizona University. Although people may find it embarrassing to discuss constipation, having frequent bowel movements contributes to a healthy body. Some people may find relief using laxatives for a time, but it is much simpler to follow a healthy diet that's rich in fiber. Many foods are sources of dietary fiber, such as cereals like brown rice. A daily serving of brown rice can significantly increase your daily fiber intake and provide relief from constipation. According to the National Digestive Diseases Information Clearinghouse, constipation means having three or fewer bowel movements per week or if the stool is hard, dry or painful to pass. Most people have experienced constipation at one time or another in their lives and this is usually created by stress, diet, taking certain medications or ignoring the urge to have a bowel movement. Constipation occurs when the stool moves too slowly through the large intestines, allowing more water to be removed by the colon and creating a hard stool. The top three recommendations by the National Digestive Diseases Information Clearinghouse are to eat more fiber, drink more liquids and exercise regularly. As recommended by The National Academy of Sciences' Institute of Medicine, the daily dietary fiber intake for an adult male should be 38 g, and for an adult female, 25 g. This fiber can be found in whole grains like brown rice, vegetables, fruits, nuts and legumes. Whole foods also provide essential vitamins and minerals that fiber supplements may not provide. When switching to a high fiber diet, it is recommended to change your diet slowly to avoid gas, bloating and cramping. Brown rice is a whole grain, meaning that it contains the germ, endosperm and bran of the kernel. In contrast, processed grains like white rice, are stripped or polished to remove the germ and bran, leaving only the starchy endosperm to create fast cooking grains with longer shelf lives. By removing the bran and germ, the majority of the fiber is also removed, as well as many of the vitamins and minerals, such as vitamin B and E. This can result in becoming constipated and malnourished. One cup of cooked brown rice contains 3.5 g of fiber, which is 9.2 percent of the total daily recommendation for an adult male. 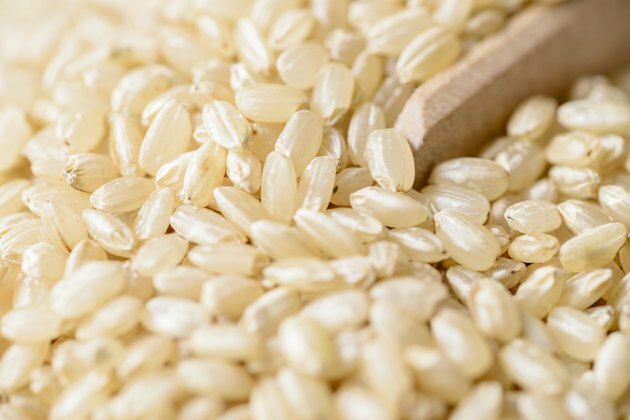 Virtually all of this fiber is in the outer shell of the rice, demonstrating the importance of whole grain consumption for constipation relief. Consuming brown rice on a regular basis will increase fiber intake to move stool faster through the colon, thereby providing a more frequent and pleasant bathroom experience. Can Eating Carbohydrates Cause Constipation?